(Oregon Coast) – Be careful as you tread on Oregon’s beaches: you could be walking on someone else’s next meal. Then there are the other wonders you probably never stopped to think about at your feet. Like what are the life spans of some of these odd creatures that wander in and out of the sea, like birds or clams? 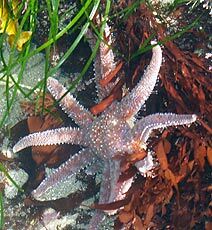 And just how fast does a starfish move? Boothe, a tireless mind always in search of the next cool factoid about the marine world, collects these funky facts like some people collect hubcaps. She wanders the beaches, photographing and looking carefully in the sand and tide pools, and then she plants herself in front of a computer and cruises the Net for the science behind what she’s found. Would you like a little jellyfish with your sea cucumber? - Certain species of limpets. 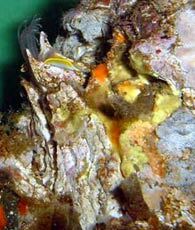 Limpets are related to snails and clams. 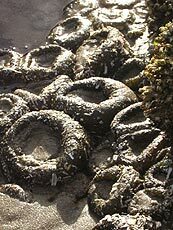 - Gumboot Chitons. These are the largest species of chitons in the world reaching lengths of 13 inches. On average, other species of chitons are about 2 to 3 inches long. - Mussels (some people know that these are edible but some do not). 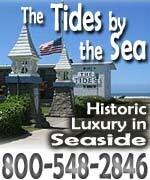 - Seaweeds such as Sea Lettuce and Bull Kelp. - California Sea Cucumber. This is the largest species of sea cucumber in Oregon’s waters. 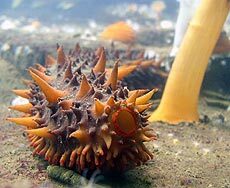 An odd little tidbit: when threatened, the California Sea Cucumber will eject their internal organs. They are able to re-generate them in six to eight weeks. - Giant Barnacle. These are one of the world's largest barnacles. Individually they are five inches high and four inches wide. They are usually roasted and eaten. - Of course scallops and other clams: Rock Scallop, Pink Scallop, Razor Clams, Cockle Clams, Goeducks, Butter Clams, etc. Many of Boothe’s notes come from simply wandering and exploring coastal tide pools, checking out the massive variety of life forms to be discovered. 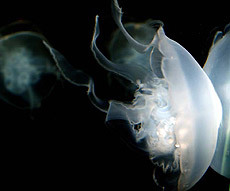 She also talks about the sea goo that may make you slip and fall while checking out these colonies of wonders yourself. One day’s exploration left her with a large list of species and creatures. “Twelve different species that I can identify,” she said. “Little Rockweed, Sea Cabbage, Laver, Black Pine, Spongy Cushion, Sea Moss, Split Kelp, Iridescent Seaweed, Scouler's Surfgrass, Winged Kelp, Coral Leaf Algae and Encrusting Coralline Algae. Now, this is just in one tidal area (granted it was quite large) and there were a few more things in there, but I couldn't identify them. “The most slippery of these were the kelps and the iridescent seaweed. The Laver and Sea Cabbage are also quite slippery. Laver grows in the upper to mid intertidal zones, so tide poolers will run into this quite often. It is slippery and you can easily fall if walking on it. So be careful. In fact, that’s often illegal, Boothe said. She added that the Little Rockweed can be very slick at some times and not at others. Boothe especially enjoys odd details about certain marine species, including how long these creatures can live. “Some species of rockfish can live over 100 years,” Boothe said, with a certain glint in her eye. Then there are those seals and sea lions. Boothe said the fastest swimming pinniped is the California Sea Lion, which clocks in at 25 miles per hour. She notes that apparently didn’t help one hapless sea lion on the north Oregon coast back in December, who wandered into Fort Stevens State park, then managed to get thoroughly lost and began meandering around the streets, scaring traffic. Park officials finally found a way to lead him back to the water on Wednesday. You can catch more at the Seaside Aquarium, on the Prom. (503) 738-6211.